Perfect for your stitching bag, this heart-shaped tape measure is 2" x 2" with tape that pulls to 40" in length and features a push button retraction. 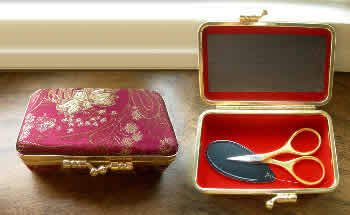 This gorgeous brocade decorative box is an attractive and chic addition to anyone's stitching stash. Each box has an outside measurement of 3.5" x 2.25" x 1" deep with assorted attractive fabric exteriors. Inside the top lid is a magnet strip to hold your needles in place. 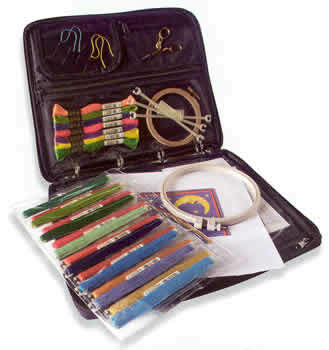 This snap-shut case includes a 2.75" embroidery scissors and a needle threader. This would be a perfect gift for a stitching enthusiast or fancy inclusion into your traveling accessories. Clear plastic 7.5" x 2.5" x 1" snap-shut case is a perfect way to keep some of your precious tools secure. Use it for your scissors, needles, laying tools and tweezers, or for your punchneedles. It would also be handy for keeping Kreinik metallics from misbehaving in your tote, or for holding the thread for a particular project. This thin chrome-plated brass handle has a four-jaw steel chuck on one end permitting easy exchange of the needle. 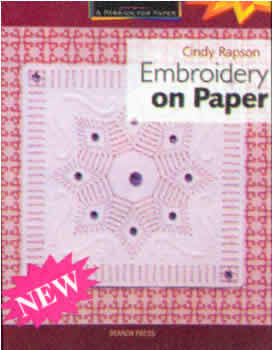 Simply change the needle size to adjust the size of the hole for embroidery on paper or decorative paper pricking. - 6" x 9" (pkg/2) Smooth, firm .25" pricking pads are perfect for embroidery on paper. With a piercing tool, heavyweight paper and threads of your choice, you can create beautiful handmade cards or framed pieces. 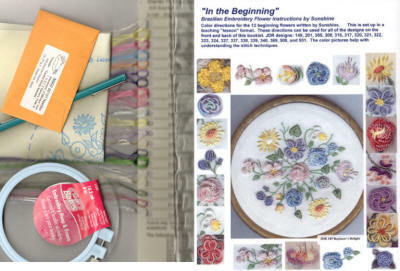 175 page book will tell you everything about embroidery on paper. It contains patterns for more than 65 seasonal and special occasion cards: Christmas, birth, marriage, birthday, sympathy, anniversary and more. You'll be thrilled with these quick, easy-to-do projects. Embroidery on paper is so versatile and can be combined with other paper craft techniques such as embossing, cutting and more. 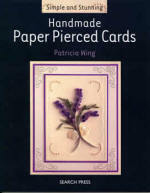 Inspiring book offers card designs for birthday, new baby, retirement, anniversary, wedding, Christmas and more. 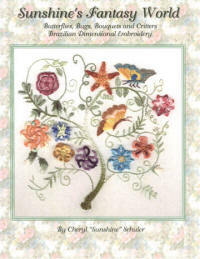 This book shows you how to make beautiful embroideries on paper using pricking and simple embroidery techniques. 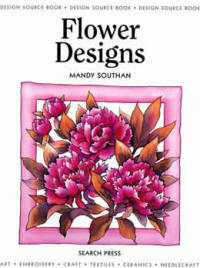 The pages are packed with inspirational patterns and designs, and each project is accompanied by full step-by-step instructions with helpful information on the materials used. How many times have your needles or scissors spilled over and you have had to go hunting behind furniture and in furniture to recover them? This handy wand extends to 35" with a strong magnetic tip to retrieve your lost needles, while you stay seated! 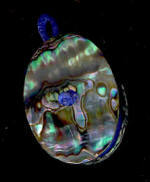 Beautiful emery with abalone sides measures 1.25 by 1.75 inches. Loop attaches to a chatelaine. Now you can sharpen your needles and keep them working longer. This inventive little mat clings to any dash and provides a skid-resistant surface for stowing your needles, scissors, or other small stitching tools as well as other small household items you don't want sliding around! It is designed to cling to any dash, it is temperature resistant, non-magnetic, and uses no adhesives, as well as being washable, reusable, and moveable! 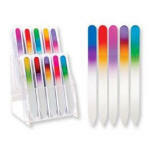 Colorful glass nail file keeps your nails fine and smooth to eliminate snagging your threads and fabric while you stitch. Comes in assorted colors, has its own case, and measures approximately 5.5" x .5". This nifty and fun sunflower shaped tool cuts sewing and embroidery thread, plus wool, has protective "petals" that keep blades from fingers, and offers a convenient built-in wire needle threader and detachable lanyard. This is great for traveling and cute to boot! DMC 3 in 1 needle threader can accommodate both short and long eye needles, plus it has three threaders for fine, medium and heavy weight threads and yarns. Fine wire is used for threading thin fibers, small hook for threading medium weight threads and yarns, and large hook for threading heavy yarns. Rainbow Needle Gripper and Victorian Scissors Set. Stainless steel 5 inch Needle Gripper with locking handles and gripper teeth is packaged with a 3.5 inch Victorian Embroidery Scissors, both with a beautifully colorful rainbow finish. Leather scissors sheath is also included! The Needle Gripper locks onto the needle with gripper teeth and will push or pull through several thicknesses of fabric. 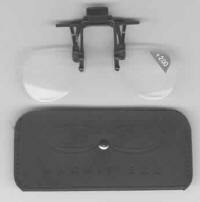 Magni Shine - Magnifier with 2 LED Lights. 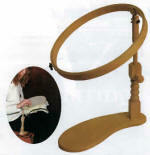 Wearable 2x power "hands-free" lighted magnifier. It's built-in with LED lights prevent eyestrain and provides bright, shadowless illumination. It has an adjustable neck cord for any sewing or craft activity where both hands are needed. MagniClips are clip-on magnifiers for people who need to focus on close-up tasks like needlework, yet they sit low enough so you can look up and see over them easily. These lightweight magnifiers also flip up when not in use. Rubberized feet protect your glasses from scratching. Lightweight and portable. 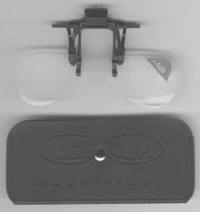 MagniClips are clip-on magnifiers for people who need to focus on close-up tasks like needlework, yet they sit low enough so you can look up and see over them easily. These lightweight magnifiers also flip up when not in use. Rubberized feet protect your glasses from scratching. Lightweight and portable. Includes naugahyde case. 3.5" scissors of quality stainless steel with gold handles and fine, sharp blades right to the tip. The finger holes are larger, a great benefit for larger or swollen fingers. Lifetime guarantee. Prym-Dritz Rubber discs for gripping and pulling needles through heavy fabric or thread. Sturdy navy canvas tote is 12" x 14" and will hold your unfinished projects and all the materials needed to stitch, including the StitchBow Floss Holders. Tote has two adjustable handles, three inner zipper pockets, needle holder, and a transparent StitchBow Binder Insert which holds 15 loaded StitchBows. 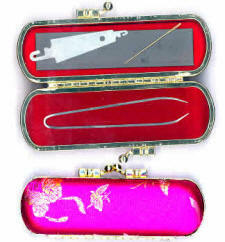 These decorative glass "tool tails" would be great to attach to your scissors as a fob. Stitchers No-Slip Hoop Tape 1/4" x 9 yards. "Sunshine is using this on a 12" hoop for holding her masterpiece tight and finds that this tape really helps." Wide base for you to place or clamp on a desk or table OR to sit on. The #15 Millinery Needle. 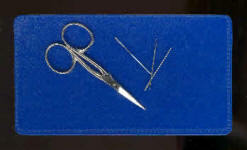 Seen here on the left, the #15 needle is much larger than the #1 Millinery Needle shown on the right. 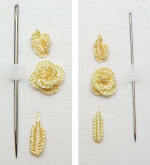 The examples of Cast-on Stitches are all made with the same thread weight and stitch counts for each needle. The larger needle creates a much more open and lace-like appearance to the Maria’s Rose and Bud as compared to the tighter, more compact look achieved by the smaller #1 millinery needle. This is an excellent addition to any stitchers set of needles, especially if you use Bouclé, Nova, or other heavy weight threads.